We are two sisters living on the island in Southern Thailand. The ocean is our backyard and our home. It became inevitably clear the destruction single-use plastic is having on our eco-systems. We pick up bags of trash daily but it continues to wash ashore day after day. Seeing the effect this has on our precious oceans ignited a flame deep with us. It is time for a change. It is time to BE THE CHANGE we wish to see. As consumers, we have the power to create change. Our power is in the daily choices that we make. Allow your choice to be your voice. Making choices that support a sustainability and all life on this planet. This is when our idea for Bhavana came. 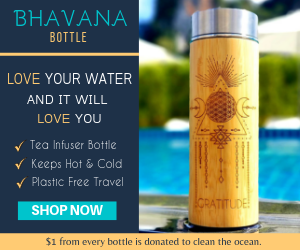 Bhavana bottle is a simple and elegant bottle encased with sacred geometry and high vibration words to bring the mind back to the present - gratitude and love for being alive. All of our products are sustainable and eco-friendly alternatives to replace single-use plastic. We wanted captivating sacred geometric designs to serve as a vehicle to bring people back to the present. We donate $1 of all product sales to cleaning the oceans. Let's work together to create a cleaner world, a place we are all proud to call home. Affiliate partners are paid 7% commission on all product sales that are generated from their affiliate link that leads to bhavanabottle.com. Once an affiliate partner sells 50 bottles, commission will be increased to 10%. Minimum of $100 in sales must be generated to receive the first payout. Payouts are distributed on the 1st of every month.